Sometimes, nothing beats a midsize SUV. If it has the right combination of capability, capacity, and connectivity, no other car on the road can offer a better value. That’s why GMC built the Acadia. And they built it for you. We break down the standout features of the 2019 GMC Acadia, for sale now in West Palm Beach, FL. Read on if you want to learn more, or visit our dealership to get up close and personal. Power comes standard on the 2019 GMC Acadia midsize SUV with the 2.5L DOHC 4-cylinder SIDI engine, which cranks out 193 horsepower and 188 lb.-ft. of torque. Looking for even more power and capability? The 310-horsepower 3.6L 6-cylinder engine with Active Fuel Management is also available. With the V6, you can tow up to 4,000 pounds. When your family adventure journeys through snow, ice, and rain, or traverses off-road, you can customize your driving settings with the Traction Select System. Depending on your trim, you can transition between traction modes — including All-Wheel Drive (AWD), Off-Road, Snow, Sport, and Trailer/Tow — for better handling and control. For enhanced fuel efficiency, opt for available Stop/Start technology. The engine automatically turns off when power isn’t needed, such as when you stop at a red light, then starts again when you accelerate. The cabin of the 2019 Acadia provides plenty of space for cargo necessities and passengers. Seating up to 7 people comfortably, passengers cruise in comfort with soft-touch materials, available second-row heated seats, and available rear climate controls which allows temperature customization for summer and winter months alike. Smart Slide second-row seats also allow passengers to easily access the third row. When you’re driving solo, but still need space for gear, fold down the second and third-row seats and use up to 79 cu. ft. of cargo room. The Acadia also comes with hidden storage spaces — including bins under the floor of the trunk — so you can pack everything you need. Keep connected during every excursion — as driver or passenger — with the technology features available in the Acadia. Apple CarPlay™ and Android Auto™ let you access your smartphone without taking your eyes off of the road ahead. With your compatible device, make hands-free phone calls, send text messages, access your music library, and more with the sound of your voice or a tap on the available 8” digital touchscreen display. 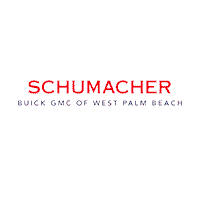 Test drive the 2019 GMC Acadia at Schumacher Buick GMC of West Palm Beach, or browse our selection of new GMC cars for sale. Call our sales department to learn more about our inventory.